For some years now the Wexner Center for the Arts on the Ohio State campus has offered a film program in conjunction with Cinevent on the Wednesday evening before the convention begins. Usually, my flight has landed me in Columbus too late to attend, but this year was different. I caught a redeye (yes, there is a redeye from Sacramento to Columbus) that got me to town bright and early, so I was able to catch the Wexner Center’s program of two pictures from the First Wave of 3D in the 1950s. 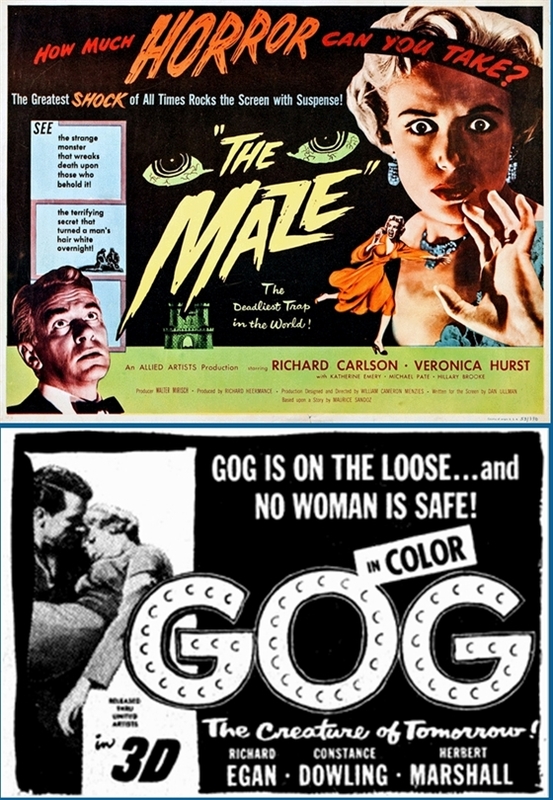 Just for fun, I’ve reproduced here a lobby card for the black-and-white The Maze (1953) in color, and an ad for Gog (1954), which was in color, in black and white. Well, these two movies were certainly something to have seen. The Wexner Center presented both pictures in their recent 4K Blu-ray incarnations, and credit is due to the 3D Film Archive (on The Maze) and archivist Bob Furmanek (Gog) for restoring these near-lost pictures to what audiences saw in the 1950s. That said, the fact remains that it wasn’t just technical and quality-control issues that killed 3D the first time around; much of the problem was that there were too few pictures like House of Wax and Kiss Me, Kate and too many like The Maze and Gog. First, The Maze. It was directed by that greatest of all cinema production designers, William Cameron Menzies (his swan song as a director), and starred Richard Carlson as the heir to a Scottish castle suddenly and mysteriously called home as he is about to be married. Not to be put off, his fiancée (Veronica Hurst) follows him, only to find him suddenly aged and coldly unwelcoming. She senses that it has something to do with the sinister topiary maze outside the castle, and the fact that her bedroom is locked from the outside every night, and she’s right. Dan Ullman’s script was based on a 1949 novel by the Swiss fantasist Maurice Sandoz (1892-1958). Sandoz’s German-language Wikipedia page says, “Characteristic of his narrative technique is that the ‘natural’ explanation, which makes the seemingly supernatural rationally comprehensible at the end of a story, is ultimately even more unbelievable than the idea of ghostly powers,” and so it is with The Maze. The picture’s 1953 ads implored, “Please do not reveal the amazing climax to your friends!”, and I’ll honor that request. Suffice it to say that at this amazing climax the Wexner Center rocked with gales of delighted laughter, and all I could think was, “Hello, ma baby/Hello, ma honey/Hello, ma ragtime gal…” (If you’ve seen The Maze, you’ll understand.) It fell to Richard Carlson to make this gobsmacking development “rationally comprehensible” in a post-climactic monologue, which he did with straight-faced aplomb, and to his eternal credit. There ought to be some special Oscar category for that kind of acting. Gog (which was released in 1954, after the 3D craze had crashed and burned, and played in 3D in only five theaters before going more or less straight to TV) also concerned itself with mysterious goings-on, this time at a remote New Mexico underground installation building the components for an orbital space station. And this time in color. The picture was well-made in its shoestring way, directed by Herbert L. Strock and gamely acted by Richard Egan, Constance Dowling and Herbert Marshall. The problem was producer Ivan Tors’s utter lack of story skills. The same shortcoming plagued his syndicated half-hour series Science Fiction Theatre (1955-57). Some of the greatest s-f short stories of all time were being published during the 1950s in magazines like Analog, Galaxy and The Magazine of Fantasy and Science Fiction, just aching to be adapted into 30-minute TV episodes. But Tors, no doubt to save money, insisted on concocting stories of his own, and he was just no damn good at it. He’d then hand a story off to writers (here it was Tom Taggert and Richard G. Taylor) to dress it up with some pseudo-scientific doubletalk. The result was invariably half-baked science and undercooked fiction. Science Fiction Theatre was an idea whose time had come, but it would take The Twilight Zone four years later to deliver the goods. Ivan Tors muffed it, and Gog was a big-screen, 3D dress rehearsal for that blown opportunity. All in all, despite the less-than-brilliant features on display, the evening at the Wexner Center was in the spirit of Cinevent, presenting Classic Era films as they were meant to be seen. Both The Maze and Gog are available on YouTube, but they are hardly the same experience — not in 3D, of course, and that’s just for starters. As we filed back to the bus to return to the hotel, not one of us doubted that we’d gotten our time-and-money’s worth. And the fun hadn’t even started yet.